If you've been reading my blog for a while, you probably already know that I'm a huge fan of the folks at Generation Q. I've watched them grow from their first blog posts and tweets to their first print issue, which I'm honored to both be in and to review for you here, on my stop of the Generation Q blog tour. And I couldn't be more proud of all of the work they've done to bring such a great publication to life. 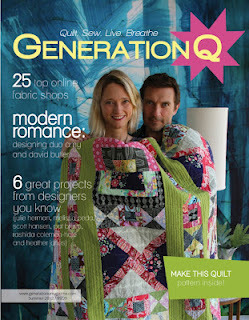 Generation Q is the brainchild of Jake Finch and Melissa Thompson Maher, who worked together previously as editors at Quilter's Home magazine. Jake is now the publisher of GenQ and Melissa is the Editor-In-Chief; with help from Creative Director Megan Dougherty and Community Editor Scott Hansen, Generation Q is a much needed resource for the newer generation of quilters. The first thing you'll notice about Generation Q Magazine is it's size. It's a bit more compact than standard magazines, but I really like the format. And even though it's smaller in size, it definitely doesn't skimp on content. In fact, the first issue of GenQ is jammed full of great projects from lots of your favorite designers including Julie Herman, Melissa Peda, Scott Hansen (who designed the gorgeous quilt on the cover with Amy and David Butler), Pat Bravo, and Rashida Coleman-Hale. And yours truly as well. I designed my You + Me quilt for GenQ and the complete pattern is included in the inaugural issue. I took some new photos of it yesterday in front of my neighbor's barn, since I really didn't have a chance to before I sent it off to Jake in California--it was a bit of a whirlwind to meet the GenQ deadline for publication! The magazine also features a great interview on power duo Amy and David Butler, a test dive of five different brands of irons, and articles on The Alzheimer's Art Quilt Initiative, working with linen, a sneak peek into Rose Hughes' colorful condo, and more. I'm telling you, Gen Q magazine is full of so many great things! Generation Q magazine is now available for sale on their website and it's also making it's way to some independent retailers across the country. And the generous folks at Gen Q are also giving away a copy of the inaugural issue to one of my readers! To enter, please leave a comment letting me know what kind of features or projects you'd like to see in future issues of Generation Q. The giveaway will be open until Thursday, July 5, 2012 at midnight EST. I'll use the random number generator to choose one winner. Please make sure that your email address is either in your blogger profile or in your comment so that I can notify you if you are the winner. International entries are welcome. Good luck! For all the latest on Generation Q, be sure to follow their blog as well as their Facebook page. And be sure to visit the other stops on the GenQ blog hop for other chances to win a copy, too! June 28 Heather Jones ---that's me! I've always wanted to be the first one to respond!This is my lucky day!!!! I would love to read about the quilters, fabric designers, what inspires them, to have tutorials, creative brainstorming, pictures, patterns....really it's all good! I would love to see how to do 'fancy' free motion - like how to use a template using powder? pencil? water soluable marker? - or how to do the 'feather' in a square or in a rectangular space type of thing. Loving the look of the magazine :) Fingers crossed for me!!! I'd like info for beginners and hope the projects will be rated for difficulty, and tips for free motion quilting would be nice. I would like to see quilting designs for these modern quilts.thanks for the chance towin a copy. I'm a quick and easy project girl. Perhaps a featured quick and easy project? Plus occasionally feature an embellishment technique. I like to see lots of photos for inspiration, and then enough information to make one of the quilts I'm inspired by myself! I also really like it when the measurements are given to make a particular block or design in a few different sizes. I would always like to see more quilt patterns/ideas. I really like to see the same quilt looking different with different fabrics! I would like to see a feature showing the same block quilted using different methods (different motifs or patterns, blendable versus contrasting thread, etc...). I tend to think in one way only, so it is nice to see some options! The different blocks could be done in different colorways, too!! would be fun to see designer studios? I like patterns that are original -- not just old patterns with new fabrics. The Block Builder feature looks interesting to me. Thanks for the chance to win! I am always interested in seeing new quilting designs on modern quilts! Thanks for the giveaway! I would like to learn more tricks of the trade from the quiltmakers. Thanks for the chance to win. I would like to see lots of patterns with pictures and color options. Also, articles about some of the modern fabric designers would be interesting to read. Your quilt is beautiful! Such a great photo as well. I love hearing what's new in quilting. My background is more traditional so I like to stay current as well as learn something new. Sounds like a magazine that's calling my name. Thank you and Gen Q for a great giveaway and a chance to win. I love modern quilts using solid colors! I am also interested in seeing budget-friendly quilts and ideas! HELLO! Love to see more free motion quilt block designs! Thanks for sharing! I like to see info quilters' design process and more discussion of creative/different quilting approaches. Thanks for the giveaway. I would like to see some pattern ideas for modern blocks. I hope I can find the magazine around here. I always love to read interviews - and essays too! - written by my favorite fabric designers. Articles that can spark my creativity are welcome as well. I think comment no.1 pretty much summed it up. Sounds like all the stuff I'd be looking for! I'd love product reviews, including pattern reviews, to help promote quilting small business to inform about their items. I love all the show me hows that open eyes and brain to new ideas along with all that is out there for us to work with and on. Thanks for the giveaway. I love seeing quilts made from solid fabrics and I learn so much about how to use color from them. So I am always pleased to see quilts whose strengths come from the interplay of color--like yours, Heather. Thanks for the giveaway--I've been looking forward to GenQ. I would love to have a copy of this magazine. Product reviews are great as well as techniques. Eye candy is always appreciated too. I can't wait to get my hands on a copy of this magazine! 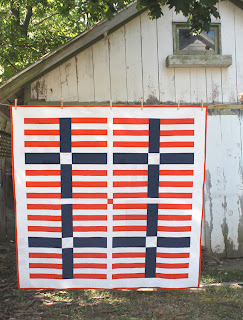 As for content...I'd like to see tutorials that dont end with the completion of the quilt talk. Provide instructions on how to quilt the top to the batting and back. It is amazing to see how quilting has changed in just a few short years. I am the hand quilter hand appliquer in our family and my sisters are the piecers. I love the old fashion, years to complete, applique while they like everything now. Somehow we still manage to work together and our pattern business is working. We feel we are covering just about everything the customer is looking for. I am so excited for everyone involved with Generation Q. Thank you for all your hard work in taking us to the next stage of quilting. Congrats to ALL!!!! I want to see more of the same Gen Q, I love what they do & I don't want them to change now they're in print. Thanks for a chance to win the magazine. I need to check that magazine out! Since I've never read it, it's hard to say what I'd like to see more of... but I do love making projects for the kitchen. I feel like so many kitchen tutorials are so kitchy (is that even spelled right?). I'd love to see some more modern designs. I would like to read more about designers process of designing a quilt and testing their patterns. What to do with projects that "seemed like a good idea at the time" or "looked like fun but ..." or "everyone else was doing it..." and what do I do with it now that it is no longer fun? i really like seeing more modern quilt designs and ideas to quilt them! Wow, this magazine just hits the right spot! Thanks for a chance! I love to see articles and patterns on the more modern quilting and would really like more stuff on quilt as you go verses free motion quilting. My machine just does not like to free motion quilt. I'm very excited about a new modern magazine! I want to see new interesting patterns and techniques ... and free-motion quilting motifs ... Thank you for the giveaway! I like pattern and instructions with pictures and are easy to follow. I'd love to see some clothing projects with a quilt element. I'm running out of beds. I love seeing new modern patterns and how other people use color. I find it very inspirational to see what other people are doing. Thanks! I love seeing quilts using solids. Can I say that I'd like to see a David Butler centrefold? LOL! Ummmmm, I guess it would be great to learn more about the behind the scenes world of fabric design and manufacture! Naturally love the quilt patterns but also enjoy seeing how they are quilted. Also appreciate reviews of new products. Thanks for the chance to win. BEAUTIFUL crisp quilt! I'd love more tutorials!!! Looks amazing - I love tips and ideas to inspire me to try new things and lots and lots of pictures. I would like to see modern interpretations of traditional blocks. Thanks for the giveaway!